Organic sulfur shipped in bulk bags. Suggested dosage is one teaspoon, twice a day. 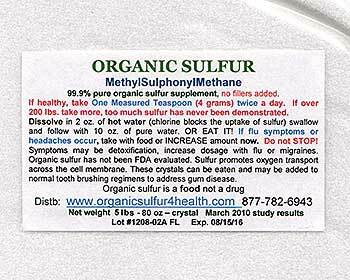 Sulfur is one of the five basic building blocks of life and is essential for maintaining good health. Most people, however, are sulfur-deficient due to poor dietary habits and the extensive use of chemical fertilizers in commercial farming that prevents crops from absorbing sulfur from the soil and interrupts the natural sulfur cycle. Check out our site to learn how you can easily address this common deficiency.